Specially designed to ease neck, back and shoulder pain, our U-shaped pillow positions and supports your entire body, contouring to your shape! Adjusting to you from head to toe, it allows custom comfort for better sleep. Pillow: 50% polyester/50% cotton outer with poly fill; hand wash; 102" long x 15" wide. Pillowcase: 50% polyester/50% cotton; machine wash; 111" long x 19 3/4" wide. No express shipping. I needed a long pillow to help with my shoulder pain and this seems like a good choice. Also I have credit with As We Change, so I decided to buy it on credit. Hopefully this will be a great buy. To better help me sleep. 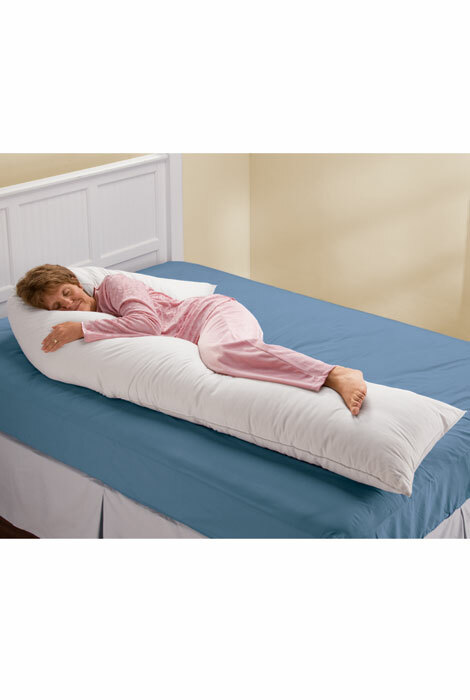 I have real problems with my back and legs and was told I should get this sort of pillow. I hope it will be well made so that I do not have to return it.